Overall, I do not understand why people hated this book. Yes, I know many love this series, but I am constantly hearing how progressively worse this series becomes. I found absolutely nothing that did not further the plot or enhance Tris’ character. Granted, this was no Divergent, but that’s not what I expected. I expected a true sequel, and I feel that that is what I got. It was not a retelling of what happened in book one, it was what happened in the aftermath, which, duh, is also known as a sequel. 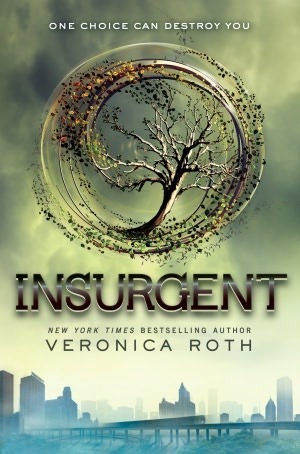 Tris' relationship with Tobias changed, she now has PTSD with the violent events she had to take part in during Divergent, it even went into detail about how it truly affected the rest of the factions and even further to the factionless. I was happy that it didn’t just focus on Tobias and Tris going off into the sunset, or roughing it outside of the fence surrounding the city. It actually made them face what was going on with their people. They had to become brave and dauntless in order to make those choices, which spoke of their character. I also enjoyed how Peter’s character was fleshed out. It was very minor, but to me, it made all of the difference. And that goes for most of the minor characters, including Marcus and others. What I thought most interesting is the division between the factions. The Amity are all about peaceful resolutions; however, we find that even some of them are hard pressed to stand back and watch these events unfold. Factions beget factions in this place after Divergent. Not all Erudite are bad. Not all Dauntless are good. Not all factionless can be trusted. Not all Candor can be believed. And not all Amity are peaceful. Overall, I felt like this was an excellent second book to the trilogy. It fleshes out areas and shows true aftermath of revolutions. It shows chaos and it shows people grow in difficult situations.